After graduating from Salford University and completing the City & Guilds Further Education Teacher’s Program in London, Dr. Brian Johnson became a faculty member at the Northern College of Podiatry, Salford University in England. He was recruited by the Government of Ontario to develop the curriculum and coordinate the opening of Canada’s First Podiatry (Chiropody) Program in Toronto; the clinical component of which was located at Toronto General Hospital. After 5 years, he moved to the Maritimes to open practices in Saint John, Charlottetown and at the Summerside Medical Centre. 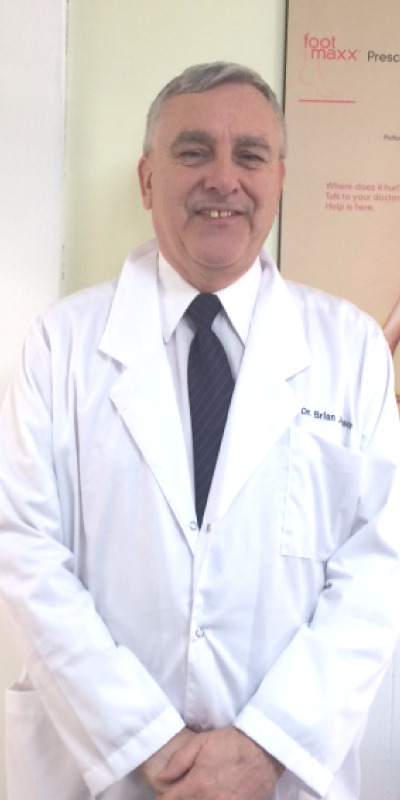 He has served 10 years on the Board of The Canadian Federation of Podiatric Medicine (CFPM). Two of these years were served as president (the only podiatrist East of Ontario to be elected president of the CFPM). Presently, he is president of the Prince Edward Island Podiatry Association and a past president of the New Brunswick Podiatry Association. Dr. Johnson’s practice includes family podiatry, diabetic foot testing, computerized gait analysis, custom moulded foot orthotics, nail surgery and acupuncture. As the Maritimes’ most experienced licensed podiatrist who has taught and graduated numerous podiatrists during his teaching career, he is able to welcome and offer all new patients the highest level of podiatric care. Dr. Johnson is the only licensed podiatrist presently practicing in Prince Edward Island and as such is recognized by all health insurance companies.